Monday through Friday: noon to 10:00 p.m.
Over 575 bottled craft beers to go with 12 beers on tap. Serving small plates of local cheeses and meats with cafe seating in the rear or standing in the front. With its wooden floors, metal chairs and vintage kitschy tin artwork on exposed brick walls, Good Beer faithfully sports the tried-and-true rustic décor of a beer-devoted haven. For café owner David Cichowicz, Good Beer is the realization of a bar concept dreamt up five years ago while still working in the publishing industry. Patrons welcome Good Beer as a perfect new addition to East Village’s 9th Street: a place where they can kick back and wash down delicious, affordable dishes with $6 pints of fresh microbrews. New York hot dogs, chewy pretzels, hefty hormone-free meats and plated cheeses — never have they gone down easier. The industrial appearance of the café is coupled with a thoughtful sensibility: all food served at Good Beer is either local, organic or heritage. Small independent vendors alongside the café in the Essex Market contribute to the menu: intriguing Ommegang beer-soaked cheese, as well as Roni-Sue's addicting chocolate twist sticks spiced with cayenne and her famous buttery caramel crackle corn. At any given time, 12 growlers feeds (for those of you unfamiliar with the lingo, a growler is a 64 oz/4-pint glass bottle) are on tap, with brands rotating every month. For those interested in taking home fresh-craft brewed ales and lager, refillable growlers with the Good Beer hallmark can be purchased for $6.99 each. In fact, Good Beer will gladly refill any 64-ounce growler you bring in, as long as it’s clean. Typically, it costs between $10 and $18 to fill one, depending on the brew. Available microbrew brands hail mostly from the Northeast, but also include those from the West Coast, Belgium, Germany, and the UK. The following are some of the brands that Good Beer carries: Brooklyn’s Sixpoint Craft Ales and Brooklyn Brewery, Coney Island Craft Lagers, Chelsea Brewery, Captain Lawrence (Pleasantville, NY), Brewery Ommegang (Cooperstown, New York), Harpoon Brewery (Boston, Massachusetts), Dogfish Head Craft Brewed Ales, and Smuttynose Brewing Company, which boasts one of the best pumpkin ales around. The café offers a few additional sweet perks for customers. Beer tastings and samples of local products from Essex Market vendors are generously offered once a week. And for enthusiasts who want to take their hobby home, Cichowicz is planning to grow hops in the café backyard during the spring and summer season. Great food and over 575 fresh brews to go— that’s a combination we can gladly toast. We keep 12 micro brews on tap to fill a growler for take out or drink by the pint in our beer café. CURRENTLY SERVING 64oz. GROWLERS to take away and on tap to drink inside the café. 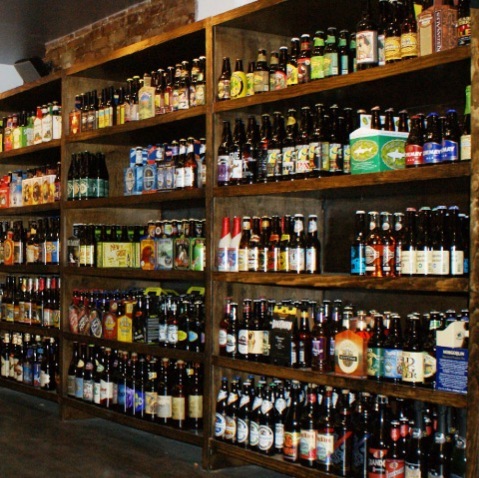 GOOD BEER IS SELLING OVER 575 DIFFERENT MICRO BREWS TO GO.